Fil-Tec's Harmony Quilting Thread consists of the finest 100% Egyptian long-staple cotton and is manufactured in the USA. Harmony Quilting Thread is 40 wt and is variegated in one-inch increments to give your quilts a truly unique design. Harmony's cotton fibers are mercerized to be extra soft with minimal lint production, meaning you'll spend less time cleaning your machine and more time sewing. 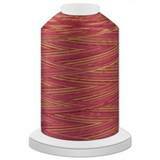 Harmony Quilting Thread is great for use with your home sewing machine, long arm quilting machine, and for hand quilting. 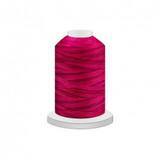 Harmony Quilting Thread is color-fast and can withstand wear and tear caused by regular laundering. Spool sizes include a 3,000 yard spool and a smaller 500 yard spool.